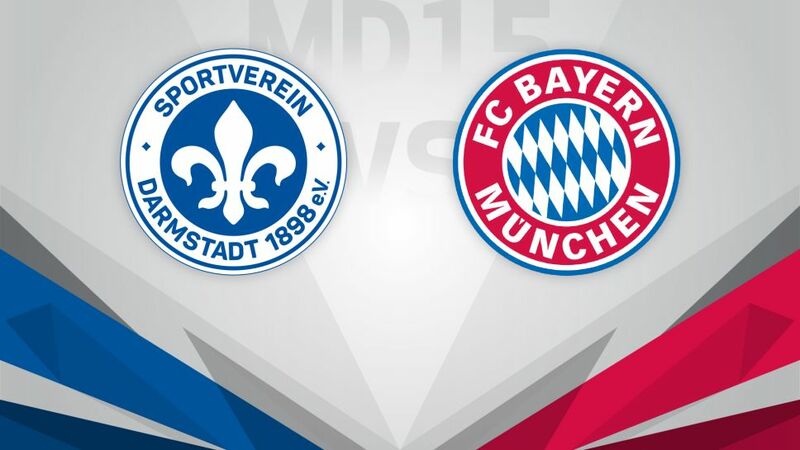 SV Darmstadt 98 will be looking to snap a six-game losing streak in the Bundesliga on Matchday 15, but it promises to be a tall order as they host resurgent champions FC Bayern München on Sunday (kick-off 15:30CET/14:30GMT). Darmstadt's poor run of form has seen them slip below Hamburger SV and FC Ingolstadt 04 to bottom spot in the Bundesliga. Admittedly, Die Lilien showed signs of improvement in their first outing under interim coach Ramon Berndroth, but they still succumbed to a 1-0 loss at SC Freiburg, and they have some tough games on the horizon. After Bayern, Darmstadt will face Hertha Berlin, Borussia Mönchengladbach, 1. FC Köln, Eintracht Frankfurt, Borussia Dortmund and TSG 1899 Hoffenheim. How they negotiate that run of fixtures could well determine their Bundesliga survival. Bayern enjoyed a perfect weekend on Matchday 14. They put five past VfL Wolfsburg, Thomas Müller finally broke his Bundesliga duck, and they reclaimed top spot as RB Leipzig were stunned by FC Ingolstadt 04. The champions will be confident of notching up their fourth straight league win against Darmstadt, a team they have beaten in six of their seven competitive meetings. With their nearest title rivals Leipzig and Hertha facing off on Saturday, this could even be a chance for Carlo Ancelotti's side to open up a gap at the top of the table.